Kleefeld on Comics: For The Love Of Comics! I made my first web site in 1995. My girlfriend at the time was finishing up her last year of school and lived about five hours away, so I had loads of free time available. I learned that my ISP was providing some free web hosting and I spent my evenings learning HTML. Once I had a reasonable handle on it (recall that this was 1995; I learned just about all the coding that was available inside a week) it occurred to me that I had no idea what to do with it. I could make a web page, but to say what? I first tried a vanity site about myself. It was kind of a cross between a MySpace page and a blog before either of those existed. All of it was hard-coded, and got about zero traffic because... well, who the hell was I? I then realized that I could use it to organize and store information about my favorite comic book, the Fantastic Four. In late high school, I had started copying information about the FF into a three-ring binder. I had typed up a list of all the issues with creator and character info, I had photocopies of fan press articles, I had an initial draft of an issue chronology. Plus a checklist of what issues I was looking for. But after a few years, the binder was getting a little awkward and unwieldy, and the internet seemed like a perfect way to keep track of everything I was trying to keep track. So I put together an FF fan site. It took a few months to get things together enough to call it a web site, as I recall. But I was really pleased with the result. As I was putting it together, I was able to include a lot of other things that weren't able to fit in my notebook. And I soon found a few other people who were attempting similar sites for the FF. Interestingly, we didn't have too much overlap in the specific material we were focusing on, but I know I got the sense there was a bit of a friendly rivalry among us to build the best FF web site. It wasn't long before my site was the largest, and eventually the others faded away as I kept building mine up. 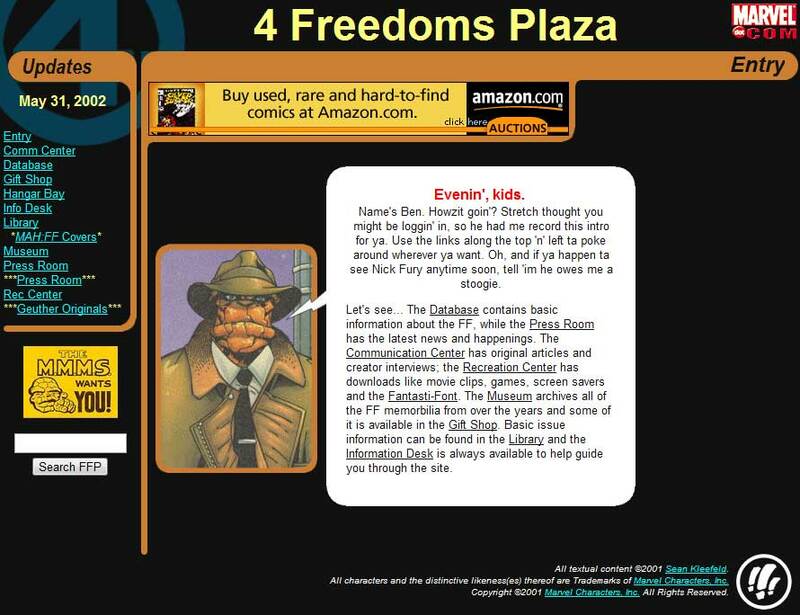 That was FFPlaza.com which has, since then, also gone defunct. I did actually make a bit off the site in later years. I sold some ad space, I was getting a small kickback from Amazon's affiliate program, I was selling bootleg copies of Roger Corman's FF movie on videotape... I never actually did the math, but I'm pretty sure I never technically came out in the black on my site. My problem, which I argued to her repeatedly, was that since the Fantastic Four were owned by Marvel, I was pretty limited in how I could make money from the venture. In fact, I eventually got a phone call from the lawyers at Marvel "asking" that I stop selling that bootleg video. Plus, even if I branched out beyond the FF into the broader realm of "mainstream" comics, what would I do that I could earn money? I certainly wasn't talented enough to make comics professionally, and there were already a few solid news sites that I wouldn't be able to compete with, since they clearly had some personal connections in the industry. The best I could come up with was to write a book on comic book fandom, but I needed more practice writing and I needed to get my name out in comicdom beyond the small circle of FF and Marvel fans that knew of me. Enter, this blog. My blog here makes very little money. A small kickback on Amazon sales, but that's it. But it has served to show that I know what I'm talking about, and worth hiring. I've gotten more than a couple paying gigs based, at least in part, on what I do here every day. And what's more: all the different comics writing gigs I have don't have much, if any, overlap. There's enough topics to cover WITHIN comics as a whole that I can maintain several different columns and my blog, without worrying about using the same material in two places. Where I'm going with this is that if you follow your passions naturally and take advantage of opportunities as they arise, you're likely to do better than if you try to force your hobby to make money for you. Granted, I'm still working a day job to pay the bills and cover my health insurance, but I like where I'm at in the broad scope of comicdom. Especially since it still is just a hobby for me, and I'm not on the constant hunt to make money talking about something I love. 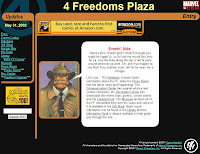 Funny you mention FFPlaza, as I was JUST looking at a page from that site I had saved yesterday. I'm pretty sure the only reason I saved it was because my name was mentioned as winning a contest. :) But it reminded me how much I missed the site. Good point, though, to not be so obsessed about making money that you can't enjoy things simply for the pleasure it brings you.